Monday Monday so good to me… (that’s all I remember) Today is Monday March 21. The sun is out this morning and pouring in the east windows of the living room (salon), the dining room (salle à manger) and the second bedroom (chambre). Phil’s task for the morning is to start the US tax return for 2015. Sandy is doing laundry and cleaning. For lunch Sandy made croque-monsieur, a grilled ham and cheese sandwich. 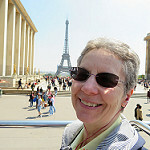 After lunch we walked to the post office (La Poste) in the Intra-Muros. I had a letter to mail to friends in Paris. It was rather heavy and I was not sure it would be okay with one stamp. One stamp will cover a letter of up to 20 grams. I had the lady in the post office weigh the letter. It came in at 18 grams. It is on its way to Paris. We then walked a short way to the Maison du Québec à Saint-Malo. From there you can walk a few yard to get to the ramparts. We walked southwest toward the harbor. The Maison du Quebec à Saint-Malo is an organization sponsored by the Canadian provence of Quebec and Saint-Malo. The link between Saint-Malo and Quebec is based on the fact that Jacque Cartier the French explorer of Canada was born in Saint-Malo. He had set sail from Saint-Malo when he first came to Canada and also for his subsequent explorations. 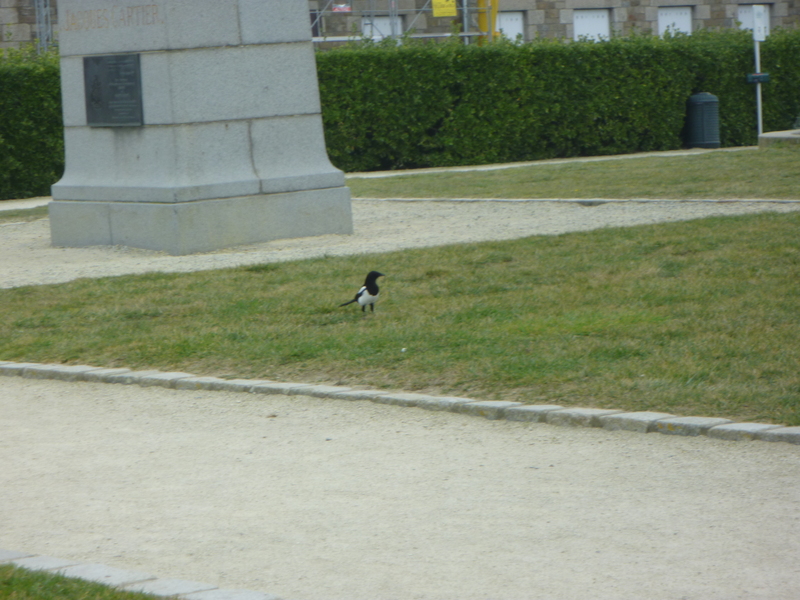 We did see a magpie hunting for food at the Bastion de la Hollande on the ramparts. It is in front of the statue of Jacques Cartier, which for some reason is not by the Maison du Quebec. The magpie is a great looking large bird with white, blue and black coloring. 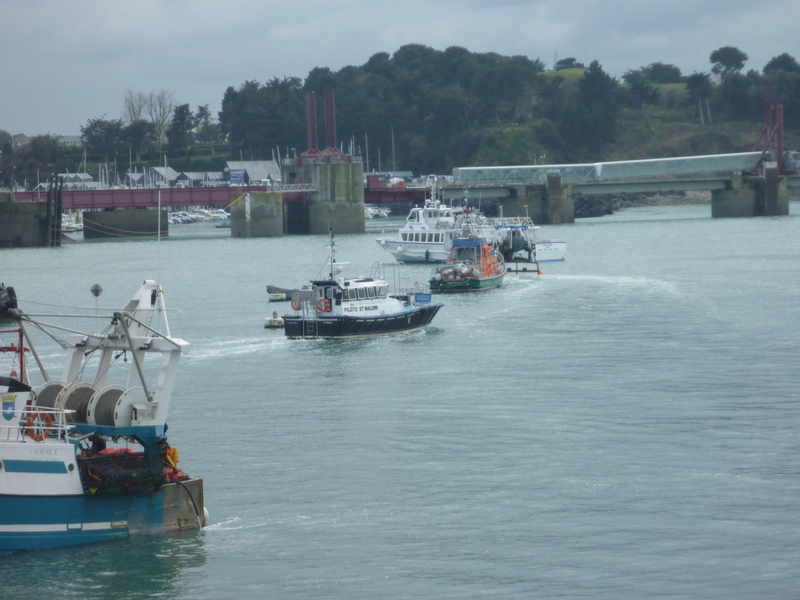 As we walked, we saw that several fishing boats were heading back to the harbor to unload their catch. So we picked up our pace and headed to the harbor. 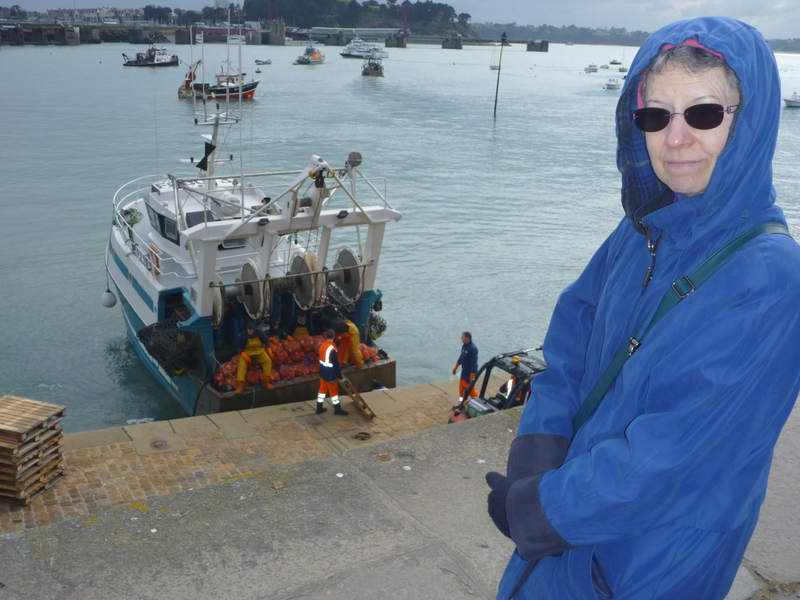 In the harbor the first fishing boat was pulling up to the boat ramp which allows them to dock and unload their catch. 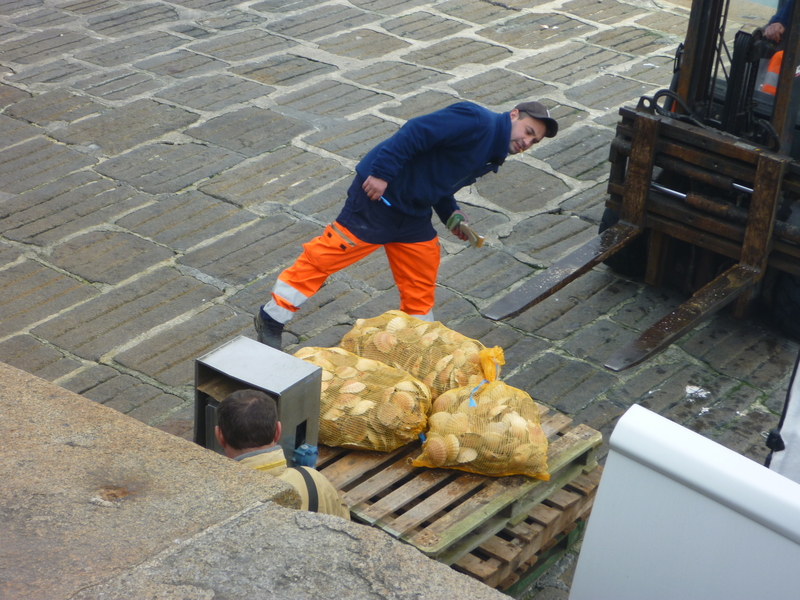 They started unloading sacks of scallops shells, coquilles st jacques. This was the first of 8 or 9 boats for the day. Quite a sight.